可算名詞 テーブル，卓 《★【解説】 引き出しのない一枚板などでできた机; 食卓・仕事台・遊戯台・細工台・手術台などに用いる; cf. desk 1a》. a green table 賭博(とばく)台 《緑色のテーブルかけを用いる》. the pleasures of the table 飲食の快楽, 食道楽. lay [set, spread] the table 食卓の用意をする. rise from table＝leave the table (食事が終わって)席を立つ. wait at table＝《主に米国で用いられる》 wait (on) table 食事の給仕をする. They keep a good table. 彼らはいつもごちそうを出す. 可算名詞 [集合的に] (食事・会議などで)テーブルを囲む人々 《★【用法】 集合体と考える時には単数，構成要素を考える時には複数扱い》. a table of cardplayers トランプをしている一座の人々. keep the table amused 一座の取り持ちをしている. set the table laughing 食卓の人々を笑わせる. a table of contents (in a book) (本の)目次, 目録. a table of interest [taxation] rates 利息[税率]表.
a table of weights and measures 度量衡表. Please put the plates on the table. The hotel keeps an excellent table. The whole table heard what she said. His joke set the table in a roar of laughter. The results of the experiments can be seen in Table 3. It is considered bad manners to make eating noises at table in Western countries. They gave him money under the table. 【２】 一覧表, 表, テーブル, 対応表. One or more rows of cells commonly used to display numbers and other items for quick reference and analysis. Items in a table are organized into rows and columns. From Middle English table, tabel, tabil, tabul, from 古期英語 tabele, tabul, tablu, tabule, tabula (“board”); also as tæfl, tæfel, an early Germanic borrowing of Latin tabula (“tablet, board, plank, chart”). 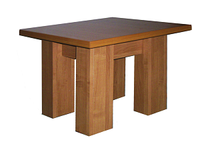 The sense of “piece of furniture with the flat top and legs” is from Old French table, of same Latin origin; 古期英語 used bēod or bord instead for this meaning: see board. The children were practising multiplication tables. Don’t you know your tables? Here is a table of natural logarithms. table (parliamentary procedure) on Wikipedia.